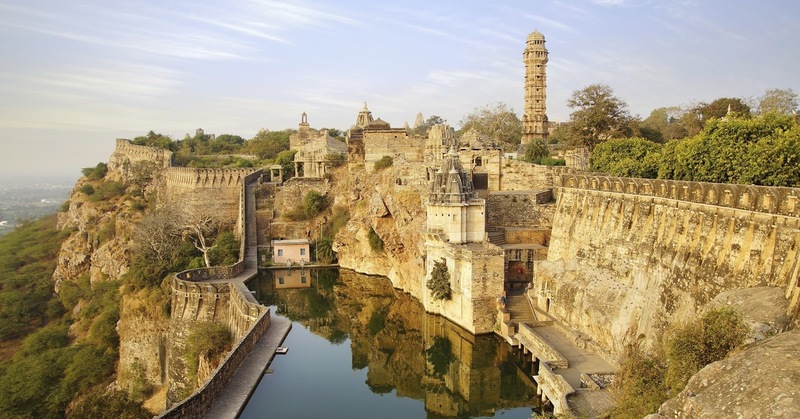 Chittorgarh Fort (Hindi/Rajasthani: चित्तौड़ दुर्ग Chittor Durg) is one of the largest forts in India and probably the grandest in the state of Rajasthan. It is a World Heritage Site. 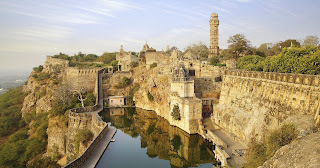 The fort, popularly known as Chittor, was the capital of Mewar and is today situated in Chittorgarh City. It was initially ruled by Guhilot and later by Sisodias, the Suryavanshi clans of Chattari Rajputs, from the 7th century, until it was finally abandoned in 1568 after the siege by Emperor Akbar in 1567. It sprawls majestically over a hill 180 m (590.6 ft) in height spread over an area of 280 ha (691.9 acres) above the plains of the valley drained by the Berach River. The fort precinct with an evocative history is studded with a series of historical palaces, gates, temples and two prominent commemoration towers. These monumental ruins have inspired the imagination of tourists and writers for centuries. Thus, the fort represents the quintessence of tribute to the nationalism, courage, medieval chivalry and sacrifice exhibited by the Mewar rulers of Sisodia and their kinsmen and women and children, between the 7th and 16th centuries. The rulers, their soldiers, the women folk of royalty and the commoners considered death as a better option than dishonor in the face of surrender to the foreign invading armies. In 2013, at the 37th session of the World Heritage Committee held in Phnom Penh, Cambodia, Chittorgarh Fort, along with 5 other forts of Rajasthan, was declared a UNESCO World Heritage Site under the group Hill Forts of Rajasthan. and also i travel some of these places.